Pat Neff was the son of Noah and Isabella Eleanor Shepherd Neff. Noah was the descendant of German immigrants to the United States. Noah came to Texas in 1849, but returned home to Virginia several years later to marry Isabella. After the wedding Noah and Isabella rode in a carriage all the way from Virginia, a trip that took fifty-two days, with the newlyweds traveling six days and resting on Sunday. Ann Richards was the 45th Governor of Texas, succeeding Governor Bill Clements. She was born Dorothy Ann Willis on September 1, 1933 to Robert Cecil and Mildred Iona Warren Willis. She grew up in the Lacy Lakeview area, just north of Waco, Texas. Her father worked as a truck driver for a pharmaceutical company. During World War II, the family briefly moved to San Diego, California before returning to live once more in Waco, Texas. She attended and graduated from Waco High School in downtown Waco. Her family was not wealthy, but she took piano and elocution lessons. Once when she was a senior at Waco High, she and classmate Marilyn Reese played a piano duet and took third place in a city-wide musical talent contest. Foreshadowing her later political career, Ann also was on the high school debate team and was selected to be a representative to Girls State, an American Legion Auxiliary leadership organization that mirrors each state’s government. She was attracted by the process and was selected as a representative to Girls Nation, a group select individuals from from among the Girls State representatives. Richards entered Baylor University in Waco after high school graduation on a debate scholarship. The future governor married her high school boyfriend, David Read Richards, in 1953 during her junior year in college, and Ann went on to graduate from Baylor University in Speech and Government the following year. Mirabeau Buonaparte Lamar was the second president of the Republic of Texas. He was born in Georgia in 1798 to John Samuel III and Rebecca Lamar. One of the youngest of eight children, Lamar was self educated, having been accepted to Princeton University, though he declined. There are two Texas traditions involving state governors and the Bible. They are referred to as the “Supreme Court Bible” and the “Governor’s Bible.” The following is the story of the Supreme Court Bible. The 1935 election of James V. Allred as governor of Texas marked a turning point for the Texas Rangers as a law enforcement organization. For several decades, the force had not kept up with the growth of crime in the Lone Star State. There were a few bright spots, however, such as former Texas Ranger Frank Hamer’s 1934 stakeout and ambush of outlaws Bonnie and Clyde. Although it had the effect of boosting the image of the Rangers that had deteriorated under earlier governors, the crime problems in the state still existed. There are two Texas traditions involving state governors and the Bible. They are referred to as the “Supreme Court Bible” and the “Governor’s Bible.” The following is the story of the Governor’s Bible. We will talk about the Supreme Court Bible in a later article. 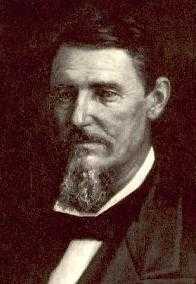 Throckmorton was born in 1825 in Sparta, Tennessee and came to Texas with his family when he was about 16 when they settled near Melissa in North Texas. His father Dr. William Throckmorton is the name sake of the town and county of Throckmorton. James studied medicine with an uncle in Kentucky before returning to Texas in 1847 to fight in the Mexican-American War. Throckmorton suffered from chronic kidney disfunction, so he only remained active for a few months. He then married, settled near McKinney in Collin County and opened up a medical practice. In the years that followed, he studied law as he also became more active in the community. Eventually, he left the practice of medicine and devoted his time to politics and the law. He successfully ran for the Texas House of Representatives in 1851 and served three terms. He then ran for the Texas Senate where he served from 1857 to 1861 until the outset of the Civil War.